With this gorgeous dining set, your friends and family can't help but be impressed. 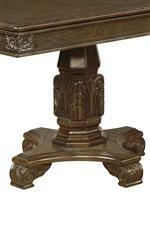 The table is covered with beautiful ornamentation that evokes Old World European antiques. Every angle conceals some new delight — from the delicate carved rosettes to the inlaid border on the table top. The table is spacious enough to seat your extended family. With two table leaves, the table grows to a full size of 108 inches. 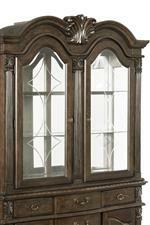 Be remembered for your exceptional taste in food, fashion, and furniture with this exquisite dining centerpiece. The Pierre Traditional Nine Piece Dining Set with Pedestal Table and Two Extension Leaves by Crown Mark at Colder's Furniture and Appliance in the Milwaukee, West Allis, Oak Creek, Delafield, Grafton, and Waukesha, WI area. Product availability may vary. Contact us for the most current availability on this product. 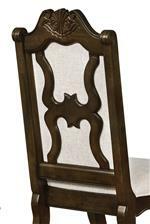 The Pierre collection is a great option if you are looking for Traditional furniture in the Milwaukee, West Allis, Oak Creek, Delafield, Grafton, and Waukesha, WI area. Browse other items in the Pierre collection from Colder's Furniture and Appliance in the Milwaukee, West Allis, Oak Creek, Delafield, Grafton, and Waukesha, WI area.